Dr Colin Porlezza is a senior lecturer and researcher from Zurich, Switzerland. He joined City University London in 2018. Currently, he is also Visiting Professor at the Institute of Media and Journalism at the Università della Svizzera italiana. He earned his doctorate at the Università della Svizzera italiana in Lugano, Switzerland, with an analysis of advertisers' influence on the editorial content of free and traditional newspapers in the German speaking part of Switzerland. He also earnd his BA and MA (licentiate) in Lugano where he studied communication sciences with a spcialization in mass comunication and new media. Before joining City, Univerity of London, he worked at the Università della Svizzera italiana, the University of Zurich and the Universiy of Neuchâtel. 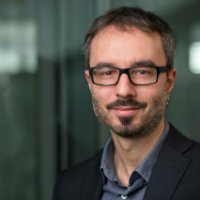 Colin Porlezza gained substantial experience in research, managing and participating actively in several publicly funded projects, among others from the European Community's Seventh Framework Programme or the Swiss National Fund, but also from news organzation such as the Swiss Public Broadcaster SRG SSR or Tamedia. Currently, he is the Principal Investigator of the DMINR project funded by the Google Digital News Initiative as well as of a project that looks into the different political actors in the Italian-speaking Swiss public service broadcaster RSI. His research focuses on data journalism, media accountability and transparency, as well as accuracy in digital journalism. His research so far has resulted in more than 30 peer-reviewed publications, including 15 journal articles and 15 book chapters, and two books with top publishers. He has given several invited talks at conferences and workshops, including keynotes on the future of journalism at the Swiss Federal Media Commission, at the Forum Alpbach Talks at Schloss Belvedere in Vienna, and the British-Swiss Chamber of Commerce. From 2004-2013 he was an active member and co-founder of the European Journalism Observatory, an institution created to build bridges by connecting different journalism cultures and facilitating collaboration between media researchers and practitioners. Dr Porlezza has also been working as a freelance journalist for various German-language newspapers and specialized magazines such as the Neue Zürcher Zeitung. He was also Co-Chair of the Journalism Studies Section of the Swiss Association of Communications and Media Research and is currently a Board member of the same association. Additionally, he is a member of the Advisory Board of the Austrian National Study of Journalists as well as the international Network Innovamedia. He has featured on the the Swiss Public Service Broadcaster SRG SSR, Poynter, the Neue Zürcher Zeitung, Tages-Anzeiger and Corriere del Ticino. French (can read, write, speak and understand spoken), German (can read, write, speak, understand spoken and peer review) and Italian (can read, write, speak, understand spoken and peer review). Porlezza, C. (2013). Gefährdete journalistische Unabhängigkeit. Konstanz: UVK. ISBN 978-3-86764-461-7. Fengler, S., Eberwein, T., Mazzoleni, G., Porlezza, C. and Russ-Mohl, S. (Eds. ), (2013). Journalists and Media Accountability: An International Study of News People in the Digital Age. Peter Lang. Porlezza, C. (2019). Data journalism and the ethics of open source. In Daly, A., Devitt, S.K. and Mann, M. (Eds. ), Good Data (pp. 189–201). Amsterdam: Institute of Network Cultures. ISBN 978-94-92302-27-4. Porlezza, C., Benecchi, E. and Colapinto, C. (2018). The transmedia revitalization of investigative journalism: Opportunities and challenges of the serial podcast. Exploring Transmedia Journalism in the Digital Age (pp. 183–201). ISBN 978-1-5225-3781-6. Eberwein, T., Porlezza, C. and Splendore, S. (2014). Media as Political Actors. International Encyclopedia of Political Communication. Hoboken: Wiley Blackwell. Di Salvo, P. and Porlezza, C. (2014). OpenLeaks. Encyclopedia of Social Media and Politics Washington: CQ Press. Fengler, S., Eberwein, T., Mazzoleni, G., Porlezza, C. and Russ-Mohl, S. (2013). Summary and Perspectives for Media Accountability. In Fengler, S., Eberwein, T., Mazzoleni, G., Porlezza, C. and Russ-Mohl, S. (Eds. ), Journalists and Media Accountability. An International Study of News People in the Digital Age. New York: Peter Lang. Porlezza, C. (2013). "Einstürzende Mauern": Folgen eines heiklen Zusammenspiels zwischen Journalismus und Werbung. In Puppis, M., Künzler, M. and Jarren, O. (Eds. ), Media structures and media performance. State of the art and perspectives. Wien: Österreichische Akademie der Wissenschaften. Colapinto, C. and Porlezza, C. (2013). Systems Theory and Innovation. In Carayannis, E.G. (Ed. ), Encyclopedia of Creativity, Invention and Entrepreneurship New York: Springer. Porlezza, C. and Russ-Mohl, S. (2012). Getting the Facts Straight in a Digital Era: Journalistic Accuracy and Trustworthiness. In Peters, C. and Broersma, M. (Eds. ), Rethinking Journalism London: Routledge. Porlezza, C. and Russ-Mohl, S. (2012). Switzerland: The Principle of Diversity. In Eberwein, T., Fengler, S., Lauk, E. and Leppik-Bork, T. (Eds. ), Mapping Media Accountability - in Europe and Beyond Köln: Herbert von Halem Verlag. Porlezza, C., Russ-Mohl, S. and Zanichelli, M. (2011). Die doppelte Schwachstelle: Fehlerhäufigkeit und Corrections Management. In fög - Forschungsbereich Öffentlichkeit und Gesellschaft, (Ed. ), Qualität der Medien Schweiz Basel: Schwabe Verlag. Porlezza, C., Russ-Mohl, S. and Zanichelli, M. (2011). Fehler über Fehler... Berichterstattungsirrtümer und Corrections Management in Tageszeitungen im internationalen Vergleich. In Wolling, J., Will, A. and Schumann, C. (Eds. ), Medieninnovationen. Wie Medienentwicklungen die Kommunikation in der Gesellschaft verändern Konstanz: UVK. Porlezza, C. (2006). Bashing the Competition, Indulging in Self-Adulation. In Egli von Matt, S., Elia, C. and Russ-Mohl, S. (Eds. ), Media Journalism in the Attention Cycle. Problems, Perspectives, Visions Lugano: Gianpiero Casagrande. Porlezza, C. (2004). Caso di studio: la Svizzera. In Corti, A. (Ed. ), L'informazione su Internet. Inizia l'era della concretezza (pp. 42–54). Lugano: European Journalism Observatory, University of Lugano. Puppis, M. and Porlezza, C. (2009). Der Röhrenblick: Warum im Journalismus nicht alles auf die private Karte gesetzt werden sollte. Carta. Porlezza, C. (2019). Deconstructing data-driven journalism. Reflexivity between the datafied society and the datafication of news work. Problemi dell'informazione, 43(3), pp. 369–392. doi:10.1445/91658 . Porlezza, C. (2018). Book Review: Dan Kennedy The Return of the Moguls. Journalism, 19(11), pp. 1629–1631. doi:10.1177/1464884918806364 . Kus, M., Eberwein, T., Porlezza, C. and Splendore, S. (2017). Training or Improvisation? : Citizen journalists and their educational backgrounds—a comparative view. Journalism Practice, 11(2-3), pp. 355–372. doi:10.1080/17512786.2016.1221737 . Porlezza, C. (2017). Under the influence: Advertisers’ impact on the content of Swiss free newspapers. Media and Communication, 5(2), pp. 31–40. doi:10.17645/mac.v5i2.901 . Eberwein, T. and Porlezza, C. (2016). Both Sides of the Story: Communication Ethics in Mediatized Worlds. Journal of Communication, 66(2), pp. 328–342. doi:10.1111/jcom.12216 . Porlezza, C. and Splendore, S. (2016). Accountability and transparency of entrepreneurial journalism: Unresolved ethical issues in crowdfunded journalism projects. Journalism Practice, 10(2), pp. 196–216. doi:10.1080/17512786.2015.1124731 . Splendore, S., Di Salvo, P., Eberwein, T., Groenhart, H., Kus, M. and Porlezza, C. (2016). Educational strategies in data journalism: A comparative study of six European countries. Journalism, 17(1), pp. 138–152. doi:10.1177/1464884915612683 . Fengler, S., Eberwein, T., Alsius, S., Baisnée, O., Bichler, K., Dobek-Ostrowska, B. … Zambrano, S.V. (2015). How effective is media self-regulation? Results from a comparative survey of European journalists. European Journal of Communication, 30(3), pp. 249–266. doi:10.1177/0267323114561009 . Porlezza, C., Maier, S.R. and Russ-Mohl, S. (2012). News accuracy in switzerland and italy: A transatlantic comparison with the US press. Journalism Practice, 6(4), pp. 530–546. doi:10.1080/17512786.2011.650923 . Porlezza, C. (2012). Online Media Accountability – A New Frontier. Studies in Communication Sciences, 12(1), pp. 2–5. Porlezza, C. and Colapinto, C. (2012). Innovation in Creative Industries: From the Quadruple Helix Model to the Systems Theory. Journal of the Knowledge Economy, 3(4), pp. 343–353. Porlezza, C., Maier, S. and Russ-Mohl, S. (2012). News Accuracy in Switzerland and Italy. Journalism Practice, 6(4), pp. 530–546. Porlezza, C., Russ-Mohl, S. and Zanichelli, M. (2010). Fehler über Fehler. Journalistik Journal, 13(2), pp. 16–17. Porlezza, C. (2008). Einer alten These verhaftet. Message, (2), pp. 98–98. Porlezza, C. (2008). Bröckelnde Mauern. Message, (4), pp. 99–100. Porlezza, C. (2006). Analytischer Blick auf den neuen Zeitungssport. Message, (3), pp. 105–106. Porlezza, C. and Russ-Mohl, S. (2006). Cultural Differences and Diversity in Communication Processes. Medienwissenschaft Schweiz, 1+2, pp. 5–6. Porlezza, C. (2006). Qualitätsmanagement durch Selbstbespiegelung. Funktionen und Potential des Medienjournalismus. Journalistik Journal, 9(2), pp. 10–10. Porlezza, C. (2005). Altered Realities. Studies in Communication Sciences, 5(1), pp. 231–232. Porlezza, C. (2005). Wie verrückt die Wahrnehmung ist. Message, (3). Porlezza, C. (2005). Zwischen Selbstbeweihrächerung und Konkurrenzkritik. Medienjournalismus in der Schweiz - drei Fallstudien. Medienwissenschaft Schweiz, 1, pp. 64–68. Porlezza, C. (2004). Die harmlosen Watch-Dogs. Zwischen Konkurrenzschelte und Selbstbeweihräucherung. Message, (3), pp. 96–98. Porlezza, C., Fengler, S., Eberwein, T. and Karmasin, M. Selbstkontrolle im Journalismus – Wunschtraum oder Wirklichkeit? Wie Journalisten etablierte und neue Instrumente der Media Accountability bewerten. .
Hungerbühler, R., Lasagni, C., Benecchi, E., Cristelli, A., Franco Cabrera Grütter, V., Myftiu, J. … Porlezza, C. (2007). L'osservazione dei programmi radiotelevisivi nella Svizzera italiana. Lugano: University of Lugano. Porlezza, C. (2005). Medienraum Tessin. Zurich: Zurich University of Applied Sciences.